Copyright © Arthur Wint, Estate. 2003 All rights reserved. F/Lt Authur Stanley Wint (May 25, 1920 – October 19, 1992) was the first Jamaican Olympic gold medalist, winning the 400 m at 1948 Summer Olympics. 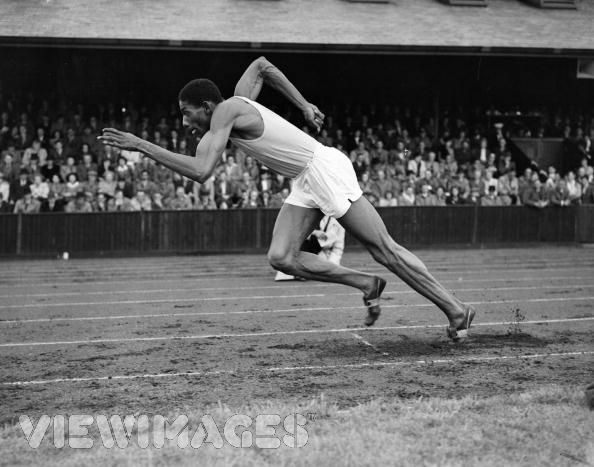 In 1942 he joined the Royal Air Force and set the Canadian 400 m record while training there. He was sent to Britain for active combat during the World War II as a pilot. He left the Royal Air Force in 1947 to attend St Bartholomew’s Hospital as a medical student.Wint, known as the Gentle Giant, was born in Plowden, Manchester, Jamaica. In 1937 he was the Jamaica Boy Athlete of the year, the following year he won a gold medal in the 800 m at the Central American Games in Panama. In Helsinki 1952 he was part of the historic team setting the world record while capturing the gold in 4 x 400 m relay. He also won silver in 800 m, again coming second to Mal Whitfield.He ran his final race in 1953 at Wembley Stadium, finished his internship, graduated as a doctor and the following year he was made a Member of the British Empire (MBE) by Queen Elizabeth II. In 1955 Wint returned to Jamaica eventually settling in Hanover as the only resident doctor in the parish. In 1973 he was awarded the Jamaica honour of the Order of Distinction. He served as Jamaica’s High Commissioner to Britain from 1974 to 1978. He was inducted in the Black Athlete’s Hall of Fame in the US (1977), the Jamaica Sports Hall of Fame (1989) and the Central American & Caribbean Athletic Confederation Hall of Fame (2003). Arthur Wint was a legendary Jamaican athelete who joined the RAF from Kingston in 1941. He trained at Monkton in Canada and was then stationed in the UK as Aircrew in Bomber Command. He flew operationally from 1944 to 1945 (requires validation). I remember seeing this picture when I was a child and being transfixed by the muscle definition. It was in either a World Sports annual, that I had as a Christmas present each year, or a souvenir book of the 1948 Olympics. In front of the National Stadium in Kingston Jamaica there is a statue for which this photograph was the inspiration. My dad was in the Canadian Infantry when Lt. Wint was in the RCAF. My dad ran his third race of the day against him, somewhere in British Columbia(400m – I don’t recall if he said it was a relay or a straight 400), came in third. I am pretty sure Lt. Wint held back a bit, though. However, my dad always regretted that he didn’t get to run fresh against this world-class runner and champion. Dad died in 1991. I can feature the races they have in Heaven now. I am about to publish a history of the West Indian RAF volunteers via Pen & Sword Publishing. I’d love to quote that anecdote about your Dad. My great-uncle was John Blair (also featured here) who wan for the RAF track team alongside Wint. The men were very close friends throughout their lives. You can reach me, if you wish, via the ‘Contact’ page on my company website (www.trmg.biz) and I’ll then send you my direct contact info. I see you are about to publish a history of the West Indian RAF volunteers. I wish to inform you of an article I did in April 2012 for the Jamaica Journal, Vol.33, No.3:21-33, called “Our men who served, selected stories of Jamaican airmean in World War 2″. I did it in honour of my uncle F/O Aston Karl Aiken, RAFVR Navigator, RAF 107 squadron, 2 TAF, (Mosquito fighter-bombers), who was killed on night operations 8 August 1944, and after whom I was named. It attempted to provide a much-needed sketch of the contribution of RAF ground and aircrew from Jamaica, giving stories of recounted to me by a few surviving veterans belonging to the RAFA here in Kingston. I threaded by uncle’s service into the whole thing. I think you might need to have a look at it and I trust that it might provide some useful information for you, if its not too late. Your work, as it seems to be a much larger document, will really help to remind people of their contribution. Best wishes.